Tall solid oak wardrobe. Condition is Used. Collection only. This is the smaller size wardrobe from the Bethan Gray Habitat Hana range. My daughter has now grown out of it but it's still in great condition. It's assembled so will require two people to collect. Lovely solid oak gents single wardrobe, 1920-30s with original features. Mirror and tie hangers fitted to the inside of the door. Bars for storing shoes in bottom. IKEA Pax Corner Wardrobe Light Oak - Disassembled. Condition is Used. Local collection at E14 London. The wardrobe is 240 cm tall, and the standard Ikea Pax size otherwise: 60cm depth, with the straight units 50cm and 100cm respectively. The Tall White One Door Wardrobe Is A Perfect Solution For Small Spaces. Suiting All Types Of Bedroom Decor. Included The Top Storage Box, 1 Adjustable Shelf & 1 Hanging Rail. It is a contemporary Swedish style which is very on trend and versatile. ASSEMBLY REQUIRED. Lovely Arts and crafts styling. Problems buying?. Splits into 3 pieces - Cornice, main body and base - for moving and transportation. Condition = good, split on the left side. Small chip to the back right cornice. An antique arts & crafts single wardrobe with a mirrored door a singlr drawer under and a hanging rail a bedroom wardrobe sizes = 95 cm w x 42 d x 198 h.
Lovely Jacobean styling in a warm oak colour. Problems buying?. Here is a beautiful piece of furniture. Splits into 4 pieces for moving and transportation - Cornice, main body is 2 sections and drawer base. An antique art nouveau solid oak wardrobe with single drawer under a mirrored door and brass motifs sizes = 203 cm h x 46 d x 107 w.
Th Century bonnetière which has been painted in Farrow & Ball’s “Cornforth White”. The door opens to reveal an interior fitted with 3 shelves and 1 drawer. This is a French 19. Dovetailed constructed drawers. Handcrafted from high grade oak and oak veneers. Amazing value for money. Product Information. Scotland : IV1 - IV15, PA1 - PA19, PH1 - PH26 £25. Main Material. Large and spacious antique wardrobe for sale. Inherited from my great grandma, this stunning Victorian/Edwardian wardrobe has beautiful detailing on the front panels, full length hanging rail, hooks on the back wall and two big drawers in the base. 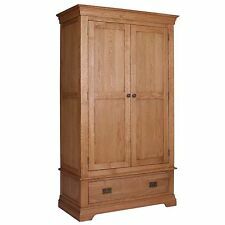 Tall Single 1 Door Wardrobe Storage Oak Effect Bedroom Furniture Compact Wardrobe With 2 Drawers. Includes The Top Storage Box, 1 Adjustable Shelf, 1 Hanging Rail & 2 Storage Drawers. The Tall Oak One Door Wardrobe Is A Perfect Solution For Small Spaces. Hung antique iron effect handles add a rustic touch. Solid dove tail drawer joints ensure longevity. Material: Solid oak. Finish: Honey oak. Getting the Right Products for You Each and every order you place is checked by one of our experienced sales team. Newlyn Oak Combination Wardrobe The Newlyn combination wardrobe is a real space-saving storage solution. Perfect for a spare room, studio or when space is at a premium. With its combination of hanging space and five drawers, you can really get a lot of use out of this highly practical item. Sturdy and stable, the Woburn 1 Door 1 Drawer Wardrobe Oak is made from solid oak and features an aptly oaky finish, making it as practical as it is appealing. Triple Sleeper Bunk Beds. Quadruple Sleeper Bunk Beds. Our newest collection of scandi inspired oak furniture will add brightness and functionality to any room. Featuring a classic blonde oak finish and a minimalistic curved design this range is destined for homes seeking the clean and fresh Nordic look. The Tall Oak One Door Wardrobe Is A Perfect Solution For Small Spaces. Suiting All Types Of Bedroom Decor. Included The Top Storage Box, 1 Adjustable Shelf & 1 Hanging Rail. If the item is large then help at your property will be needed. 38, 16.5, 73. Perfect As A Cloakroom Cupboard For A Hallway. Ideal Hall Cupboard, Practical & Functional. The Cupboard Is Strong & Sturdy. All Hooks Strong. There Is A Fixing To The Centre Top With May Have Had A Triple Hook On That Is No Longer Present. THEN THE WARDROBE HAS BEEN LIGHTLY DISTRESSED ON THE LINES AND RIDGES. THE DOOR HANDLE ALSO DOUBLES UP AS A CATCH AS PICTURE ILLUSTRATES. THEN ALL THE PAINTWORK HAS BEEN WAXED WITH SEVERAL LAYERS OF LIBERON CLEAR WAX WHICH GIVES THE UNIT DURABILITY AND EXTRA PROTECTION FROM KNOCKS AND SCRATCHES. 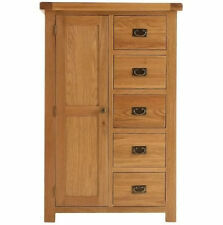 This is a lovely Oak wardrobe c1900-20 with classic form. It has a single drawer to the bottom with oak linings to the drawer and all original handles. The central bevel edge mirror glass door is hinged on the right and opens to reveal a hanging rail and hooks. VICTORIAN PAINTED CUPBOARD. With adjustable shelves. Working lock and key. It has been painted in Annie Sloan chalk paint 'Paris Grey', rubbed with clear and dark wax and distressed to give an authentic aged look and durable finish. The Newland range is hand crafted, featuring gorgeous clean golden oak and sleek tapered legs. Part of our striking Newland Oak Range. With a single wardrobe space with a shelf behind a single door. At Oak Solution, we only house the very best furniture of the utmost quality. 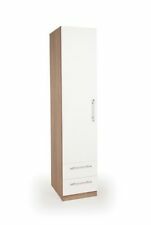 Hygena Atlas Corner Unit - Choice of White / Oak / Walnut. An emphasis for quality has been placed on the design of the Woburn 2 Door Wardrobe, focusing on the use of only the finest materials. Perfect for the likes of suits, dresses and coats, the Woburn 2 Door Wardrobe Oak features a huge amount of storage space, complete with a single rail, for clothing that requires plenty of room to hang. The back panel incorporates 4 large ventilation holes to allow for air circulation within the cabinet. Collection is fine though. Crafted from high quality and carefully chosen oak, this stunning Monza rustic range of furniture is sure to go unnoticed. Can be mixed and matched with the rest of our Monza range. The selection of the Oak timbers have been specially chosen with knots and aged appearance to reflect the rustic appearance to each individual piece of furniture. Our Zelah oak single wardrobe is crafted from high quality oak and provides useful storage in the bedroom. The rounded edges of the Zelah pieces gives a wonderful rustic touch to any room. All drawers within the Zelah range are crafted with dovetail joints. The selection of the Oak timbers have been specially chosen with knots and aged appearance to reflect the rustic appearance to each individual piece of furniture. The range takes its inspiration from country living crafted from selected oak and gently aged in areas with soft curved edges. Wardrobe, larder, oak, French, antique, mirror, veneer inlay, excellent item. 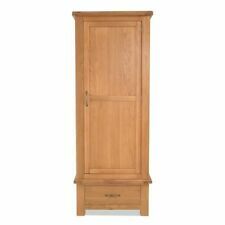 This is a fabulous solid oak wardrobe that has been fitted with shelves to make it into a very useful cupboard or larder. These shelves could easily be removed and a rail installed if it were to be used as a wardrobe. Crafted from high quality and carefully chosen oak, this stunning Odessa rustic range of furniture is sure to go unnoticed. Can be mixed and matched with the rest of our Odessa range. The selection of the Oak timbers have been specially chosen with knots and aged appearance to reflect the rustic appearance to each individual piece of furniture. The Kingsford Oak collection is one of the most diverse collections available, you can find the perfect item whatever style or size of your home. A stylish range with its rich colour, subtle rustic edge, chunky tops, and metal handles create a distinct look. The Cordell range is hand crafted, featuring gorgeous clean golden oak and sleek tapered legs. Part of our striking Cordell Oak Range. With a single wardrobe space with a shelf behind a single door. Quality Furniture at an Unbeatable Price.